'S e 3 an Cèitean an 123mh latha dhen bhliadhna a rèir a' Mhìosachain Ghriogaraich (124mh ann am bliadhna-leum). Tha 242 latha air fhàgail gus deireadh na bliadhna. 1715 - Dubhradh na grèine air fad. 1802 - Inbhe cathrach do Washington, D.C..
1921 - Chaidh Èirinn a roinn ann an Èirinn a Tuath agus Èirinn a Deas. 1960 - Chaidh taigh-tasgaidh Taigh Anne Frank a dh'fhosgladh ann am Amsterdam. 1933 - James Brown, ann am Barnwell South Carolina. Ceòladair às na Stàitean Aonaichte. 1891 - Manuel María Ramírez Fortoul, ann am Bogotá. Fear-poileataigs à Coloimbia. 2008 - Leopoldo Calvo-Sotelo y Bustelo, ann am Madrid. Fear-poileataigs às an Spàinn. 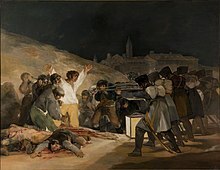 'S e An treasa dhen Chèitean 1808 (El tres de mayo de 1808 en Madrid no Los fusilamientos de la montaña del Príncipe Pío) an t-ainm a tha air dealbh ainmeil le Francisco Goya. Air a tharraing à "https://gd.wikipedia.org/w/index.php?title=3_an_Cèitean&oldid=521635"